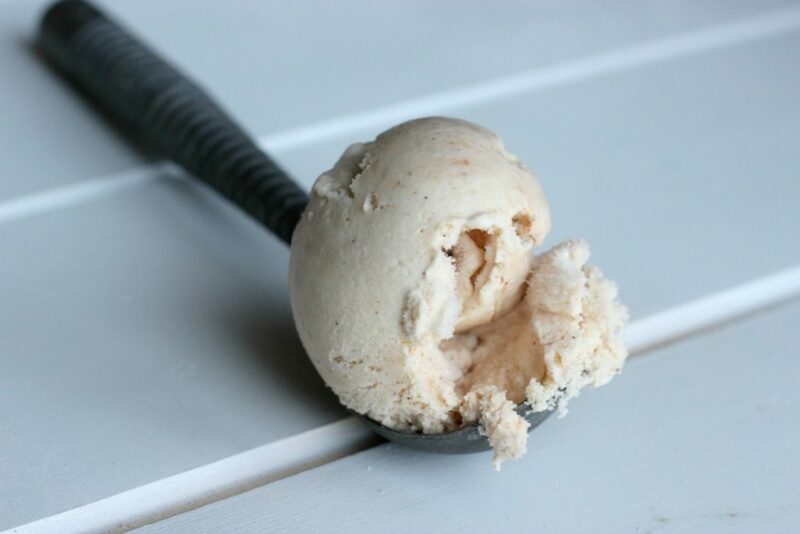 Just because summer is long gone doesn’t mean you can’t have ice cream. Remember that slow cooker apple butter we made? 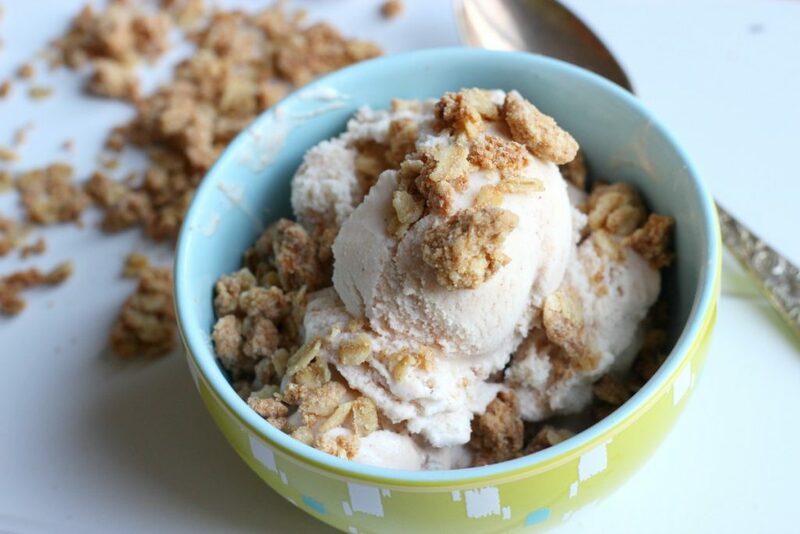 We’ve added it to ice cream and made a cinnamon oat crumble to top it all off. I started off with a basic Philadelphia style (that means we didn’t use any eggs) vanilla ice cream base and stirred in the apple butter. The oat crumble was added because I love crumble. Really, really love crumble. It’s perfect over this ice cream. The ginger and cinnamon in the apple butter shine through, the apples provide a bit of sweetness and the oats that bit of crunch. It’s like fall in a scoop of ice cream. Soooo gooooood! In a medium pot, over low heat, add 1 cup of cream and the sugar. Stir until the sugar dissolves. Scrape the seeds from the vanilla bean and add to the pot along with the pod. Remove the cream/sugar from the stove top and add the remaining cream and whole milk. Add the vanilla extract and salt. Place in the refrigerator and allow to cool completely. When the mixture has completely cooled, remove the vanilla bean. Add the mixture to an ice cream maker and process according to manufacturer’s instructions. Add the apple butter in by the spoonful at the end of the cycle. 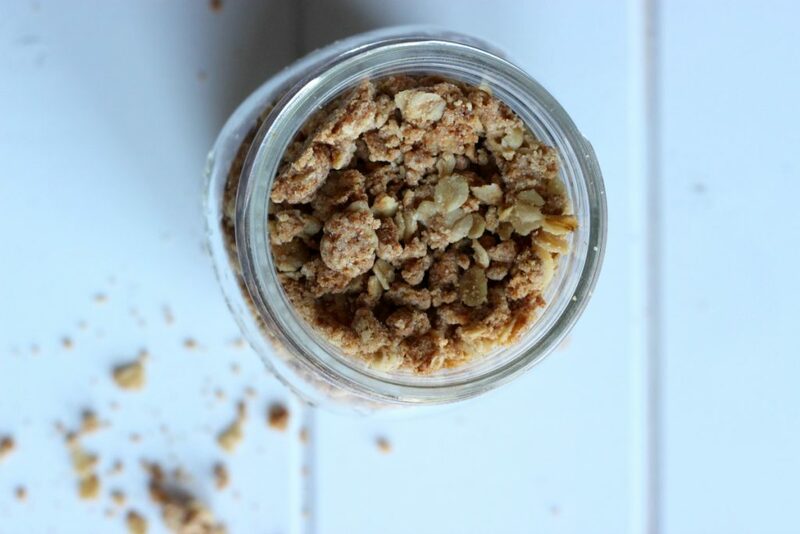 Serve with oat crumble topping (recipe below). 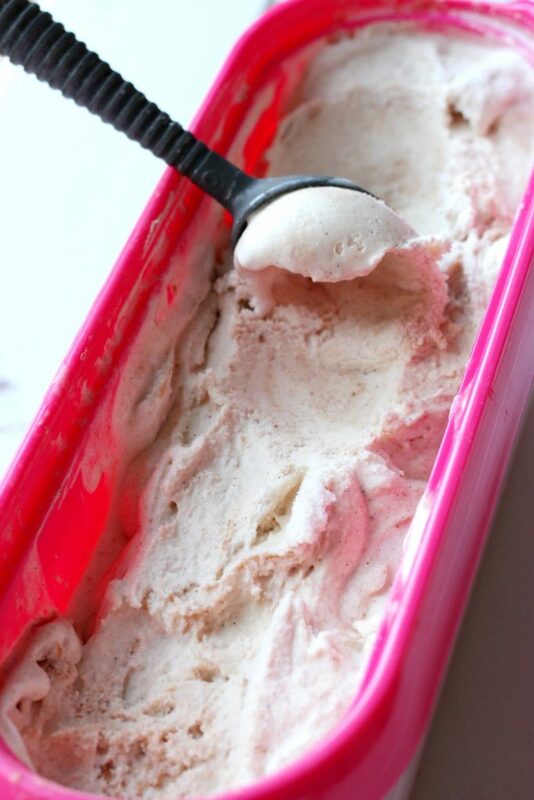 Tip: If the ice cream has been stored in the freezer, just let it sit at room temperature for 5-10 minutes. This will make it easier to scoop. Homemade ice cream tends to harden a bit more than the store bought variety so leaving it out to thaw for a few minutes will make it easier to work with. Preheat an oven to 350°F. Add flour, brown sugar, cinnamon and salt to a medium bowl. Mix the dry ingredients to combine. Add the butter and use your hands to work the butter into the mixture. Keep breaking apart the butter and pressing into the dry ingredients until the mixture resembles coarse, wet sand. Stir in the oats. Transfer the mixture to a rimmed baking sheet breaking up any large clumps and spread it out evenly. Bake until the mixture turns golden brown and crisp (approximately 30 minutes). Stir the mixture every 10 minutes to ensure even cooking. Allow the crumble to cool before adding it over ice cream. I store this in a mason jar and keep it in the freezer for anytime I want a bit of crumble over my ice cream.